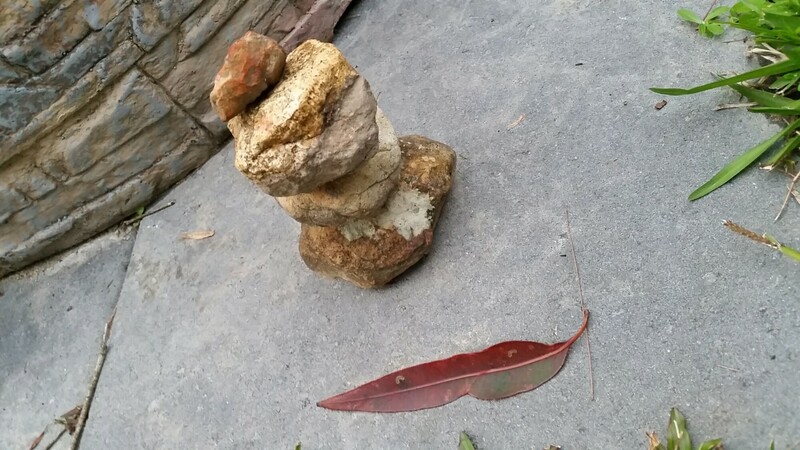 Creative Expression of Life | … is all that matters here! Balancing art creation with work to pay for living expenses can be frustrating and draining for artists, who have the muse nagging at us and a creative fire in the belly that is difficult to appease, while doing a regular job – whatever that may be for each of us. Over the years, I have often quietly felt that I’m selling my soul for fiscal responsibilities in a world that is skewed to favour the more business minded soul. Yet, while one part of my heart has often yearned for the freedom of self-expression, another part has been determined to support my family as best as I can. I know I’m not alone in this, I regularly hear creator mums voicing their struggle with this same conundrum. Perhaps there is valuable learning in the juggling. I know I have learned a lot about myself, within the constraints of time. I have met and made some inspiring friends at each place of work. I’ve also learned new crafting techniques that I perhaps wouldn’t have turned to had they not been an ideal fit to weekend creative freedom. Please don’t get me wrong, I actually love my current place of work and haven’t got enough fingers and toes to count the blessings I’ve received while working there. In fact, the supportive environment and accepting colleagues have actually helped me to more clearly understand and accept myself … and that includes validating my artistic nature more deeply myself. In recent months I’ve found myself mentally beginning afresh as motherly responsibility seeps away with the sands of time and my son is now an adult. What to do with myself in the next phase of my life? New found freedom from parenting provides me extra weekend time to make creative tutorial videos and I’m happy that these are proving useful and popular. But this has left me wanting more. More time to create art. More time to make jewellery. More time to shoot and edit footage. The most exciting discovery an artist can make which has the potential to free up time for creation, is patreon.com. Patreon is a win-win platform for artists and patrons alike. Artists find patronage (like crowd funding) but the beauty is patrons can pledge from as little as $1, and there are different pledging tiers plus they receive rewards back from the artist for their support. I love it. So if you’re an artist with the dilemma of making more of a passive income from fans so you can provide them with more of your creative bounty, check it out. My page shows how I’ve arranged my rewards for patrons. Do become a patron of mine if you’re inspired – it’ll be a great journey with you coming aboard early on! If you’re a creator and want to get your own page, if you use this link, we can both benefit. I’d love to hear from you about your artistic vs financial responsibility experiences, struggles and triumphs. Whatever your thoughts are on funding, I wish you a creative flow that is fulfilling for you. New crafting video uploaded despite audio alerts! Don’t you love it when you’ve promised yourself an early night and have everything nicely uploading to YouTube, for a smooth publish, including subtitles and a nice little hand-made thumbnail – then listening to the newly published video you realise some of the background music is more foreground music? When you listen to the video, you are suddenly jarred into alert!! Gawd. So what do you do? Stomp around swearing with a-gnashing-of-teeth? I sure felt like it. But would be the point of that? I’d end up with high blood pressure and a few years of enamel ground down off my molars, and I’d still have to re-upload the video. I mean, I wouldn’t want anyone watching it with headphones to have their eardrums blasted into their amygdalas. So, deep breath, stoic expression, shuffle around on typing chair and off we go again. Back into Premiere Pro, fine-tuning the audio gain, re-compressing for YouTube, waiting for half an hour for re-compression only to find the pc’s been waiting for me to answer “do you want to save over your old file?” “YESSSS!!!”. Back to lounge for another half an hour. Upload and wait for two or so hours, while I re-write the tags, but thankfully only paste the description as at least one part of me had been alert during the process. So, now it’s all loaded, with subtitles re-edited, and a nice new end template to boot. 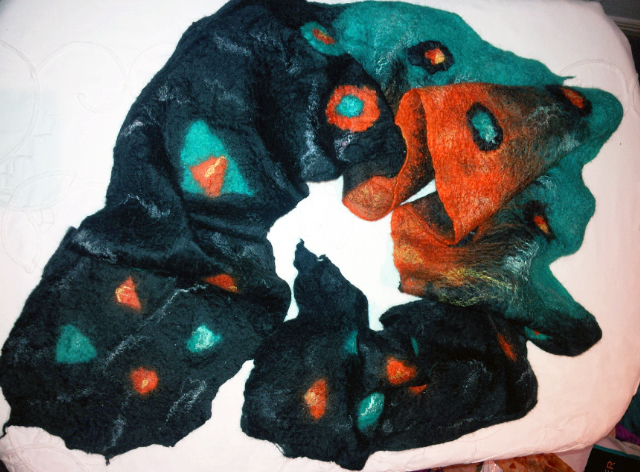 YouTube have kindly notified Twitter, who is kindly posting on my Facebook page, so all I have left to do is notify a couple of other felting and eco-printing sites and I’m good to go – to bed that is. It’s way past my bed time and of course, it coincides with the one day I’ve arranged to start walking with my husband at some crack of dawn hour tomorrow morning! Having had a proper whinge now though, (and thank you for reading this far, I really appreciate you ‘listening’), I must say, I love the video. It isn’t long, but I think it’s quite a good tutorial. 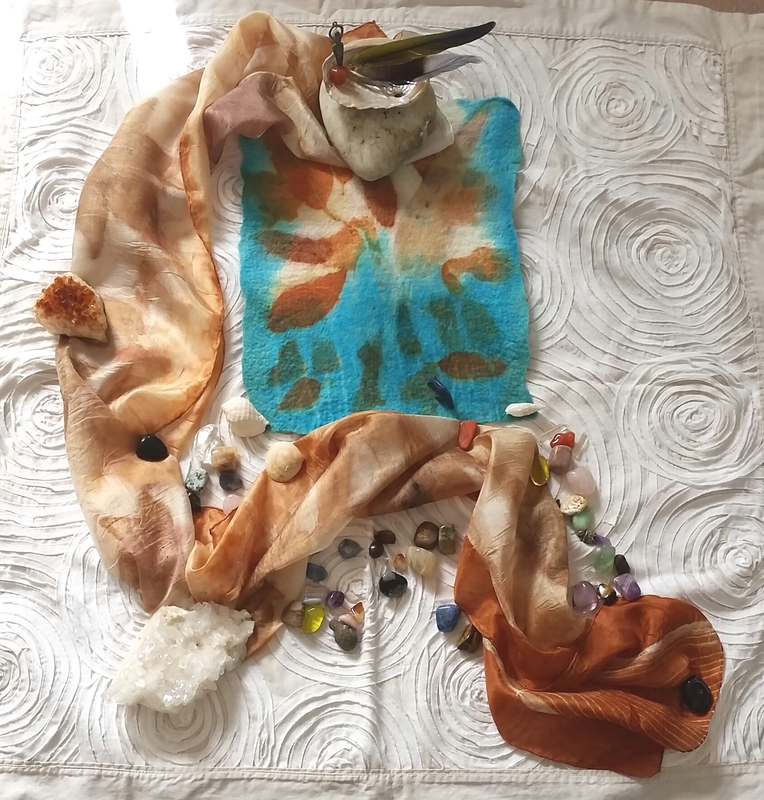 I mean, if you like felting and eco-dyeing and want to learn to make a nuno felt scarf that you can eco-dye for extra dimension and colour, it’s definitely the video for you! Check it out here. 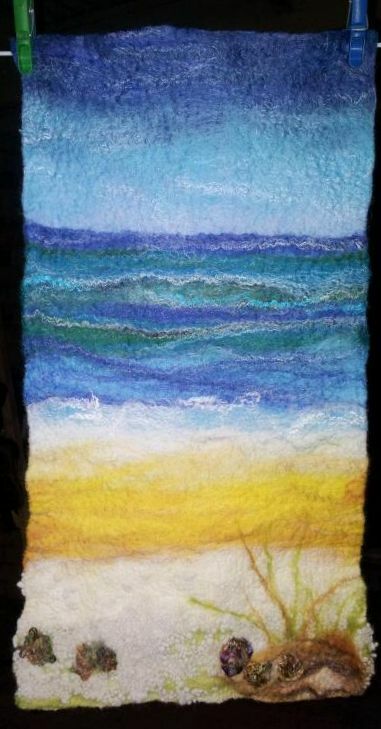 As you know if you’ve been following my blog, I love making felt paintings. I have to say though, my life has been so busy with other projects for a few months, that I haven’t made any for ages. Recently though, I was asked to make a video tutorial, so here it is. The pics don’t really capture the depths of the blues at the top of the painting, but I think you get the idea. I had immense fun getting all my wool and silk rovings and searching through my yarn box for just the right variegated and also dimensional yarns, and then even more joy as the little painting came together. 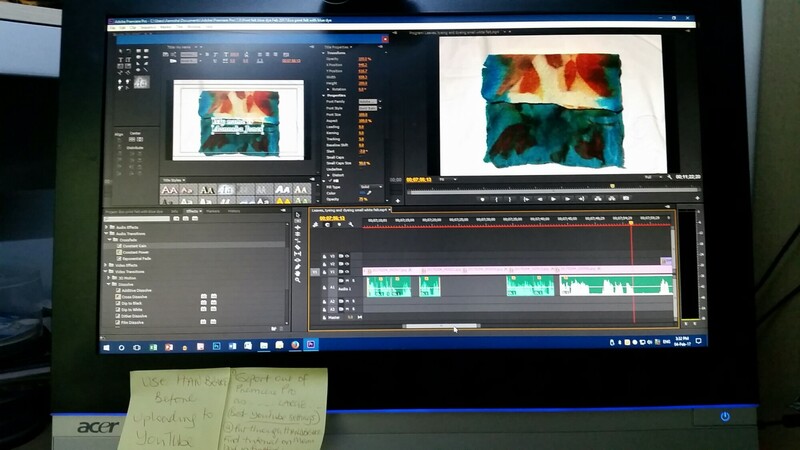 I’m getting used to filming the process, and even the editing is taking less time – still a.g.e.s. – but I’m getting the hang of it, and the rendering and Handbraking and uploading to YouTube with the tags and what-have-you, so people who are searching for a felt picture tutorial, actually discover it! My desire was to make an attractive picture that was easy to demonstrate, and also copy if someone wants to – without too many intricate materials or steps. I may make a more complex picture later, if I get enough interest. Or I’ll make another one for the love of it, and may even video it as I make it! 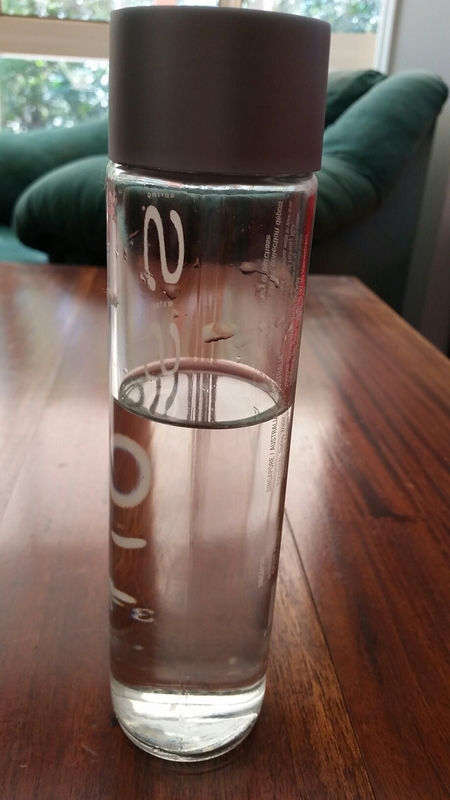 I love my glass drink bottle, but don’t like how it bangs against things and want to avoid breaking it. I also want something with a handle so it’s easier to carry for long periods, say, when I’m out walking. I’ve recently learned to use macrame for jewellery and thought I’d upsize to my water bottle. 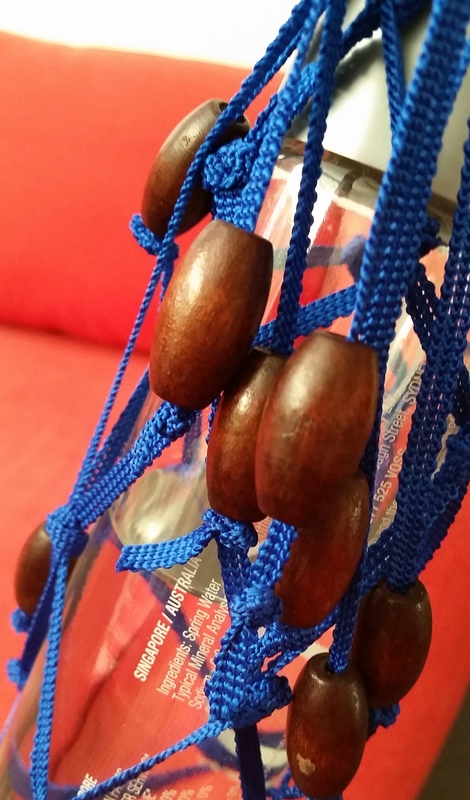 Macrame glass shell necklace. It is free to remove for cleaning and I tied a handle for comfy carrying. 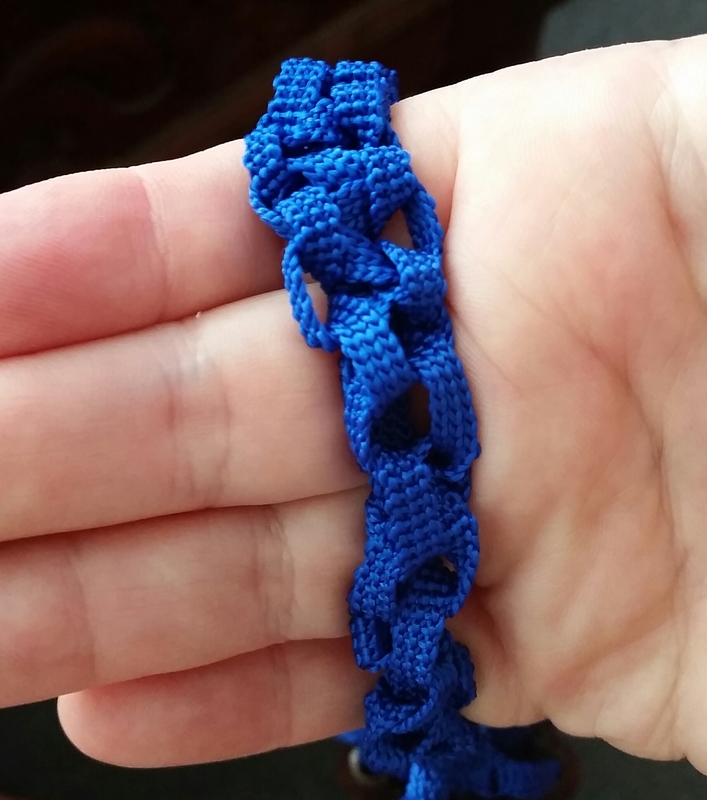 So the knot wouldn’t annoy me, I tied the handle off on one side and then finished the ends with wooden beads. These look nice and are softer then glass beads when they hit the side. I love this simple netting and it has a bit of a nautical feel too. What do you think? Here it is hanging on a hook. What do you do when your eco-printing results flop big time? I’d forgotten just how disappointing that can be. My latest creative efforts have been very satisfying, so I felt a bit slugged when today’s experiment went south. In one day, I went from anticipation, to disappointment, to determination, to delight. Here’s how. I’m in a real creative phase at the moment, and this morning woke up itching to dye something. I rummaged in one of my cupboards and came across a brown paper bag stuffed to bursting with some old (literally – they’re vintage) linings from kimonos that a friend of mine gave me a couple of years ago to eco-print. Using one oblong of silk that had once graced the inside of a kimono (and perhaps a geisha’s) sleeve, I set about eco-printing it with some kale slaw mix from Aldi, as I figured all the ingredients in that had potential to give up their dye. I also threw on some cut red onion and a few lychee skins for good measure. All excited, I wrapped it tightly in a bundle and waited for it to steam. Well, I didn’t wait, I distracted myself with another project until the timer went off. Like a kid in a toy shop, when it was cool enough, I unravelled the string and swept away the damp plant material … only to be massively disappointed. The kale hadn’t left any marks, the lychees, only an imprint. The only marks given up had come reluctantly from the red cabbage, beetroot and onion. After hanging the soaking strip out to dry, I was comforted to note a slight oxidation on the lychees, but overall, I had to admit that this wasn’t my most spectacular result. The strongest part of the print was the smell – reminiscent of vegetable soup. As I had to do the weekly shopping, I set off to the shops in town, all the time pondering in the back of my mind how I could do the vintage silk more justice. Cruising past the vegetables in IGA, my little eye spied a large red cabbage. Perfect! I brought it home heavily disguised as family food, then purloined it for a higher purpose. I must admit, knowing my two boys’ (husband and teenage son) taste in brassicas, it wouldn’t be hugely missed. A few hours later of multi-tasking: dying with preparing the family dinner – which I didn’t think would be a problem with this eco-dye, considering the most toxic chemical I used to shift the dye colour was cooking salt – I eventually brought into life two unique creations. The first was chicken Mediterranean style cooked with mirepoix, capsicum, passata and Moroccan spices which looked and tasted rather good, if you’ll pardon the self-praise. The second was the rather gorgeous cabbage-dyed vintage kimono silk. I know, it looks like something I could have dragged out of a river in this photo, but as you’ll see shortly, it dried beautifully. One amusing result was the queen’s head which imprinted from one of the 50 cent pieces that I ‘shirboried’ before dyeing. I think the coin must have had a chemical on its surface, because the bright purple image is a lot sharper than the other shades of lavender from the cabbage. Here it is directly after untying the bundle. Once dried and ironed, I noticed some interesting and unexpected small dark brown oval marks on the fabric. It occurred to me suddenly that these marks were where the lychee skin had been, and it was possibly tannin from the skin that had highlighted the dye in those areas! Finally, here is the result, showing just how beautiful natural dyeing can be, especially when imparted onto a natural material, and in particular, one that has aged as gracefully as the Japanese lady who once wore it. I’m excited about this video because it is one of many ideas that are coming to mind where I can share some of my creative ideas and experience with you. One of the crafting videos I’ve recently made is on eco-printing a piece of felt. It was a fun process and one I loved because it involved all kinds of creativity from making the felt, to eco-printing it and then making and editing the video for YouTube. And this is just one of several I’ve made so far. Closeup of detail from one of the eco-printed and dyed pieces of felt I made recently for a tutorial. If you want to know full details or watch the complete process of either making felt or eco-printing, zip over to Youtube.com\AannshaJones now! At the time of writing, I’ve got three more videos in the pipeline for editing and uploading and many more ideas to share with you. Making videos is a creative process in itself and I’m enjoying the learning (and have also pulled my hair out over some of the challenges) but hey, that’s the combined beauty of creating isn’t it? All ready for their debut at the CWA Easter Art & Craft Twilight Markets in Beerwah on Saturday 4th April, here are lots of little boxes of Gratitude. Each box is filled with 100 mini cards with “Thank you” on the back and “I am grateful for” x 98 different qualities and things – plus two blank cards to represent either infinite possibilities or for you to write your own quality on there. I love the quality printing and cards, as well as the little gift boxes that each comes in. What a lovely gift of gratitude to give the world – like so many new babies – that I have had the pleasure in making. This project began in 2006, and I realise now that I needed to work through my own non-gratitude to a much more fulfilled place within myself before they could be born. Over the last 8 years, I have come face-to-face with those pockets within me that were not grateful but small, clinging and miserable parts of myself that had lost touch with what I call my true Essence. My inner journey has taken me on lots of self-focused meditations and transformational zones, where I released so much of what was keeping me small and ‘dark’. To me, Easter is a wonderful time of symbolic renewal in which to present these cards, as each one has within it the potential to assist personal transformation on many levels. If you’re in Beerwah on the 4th April, please do come along and say hello and choose a card to receive a free ‘gift of gratitude’! 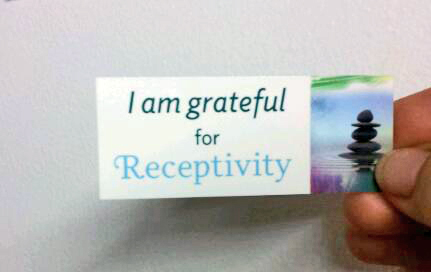 I’m writing the little booklet that will accompany the boxes of cards, and the card I chose to assist me with this was Receptivity. …And lots of other things as well! Since I wrote my last post, I have bundled, boiled, dried, rinsed, dried and ironed quite a few new eco-printed shirts and tees. All ready for the CWA Easter Art & Craft Twilight Market on 4th April. Rather than bore you with the details, which are similar as for previous posts, I’ll add a gallery of my latest beautiful nature-painted clothes. I’ve taken photos of them in the last few moments of sunlight in front of our mini-rainforest – so the colours of the eco-dyed clothes are enhanced by the trees and bushes, and natural light.